Acuvue Oasys for astigmatism: Finally the perfect daily contact lenses (if you have astigmatism)? Contact lens options have been exploding over the past several years, with way more features (and marketing hype buzz words), and sometimes eye-water prices. 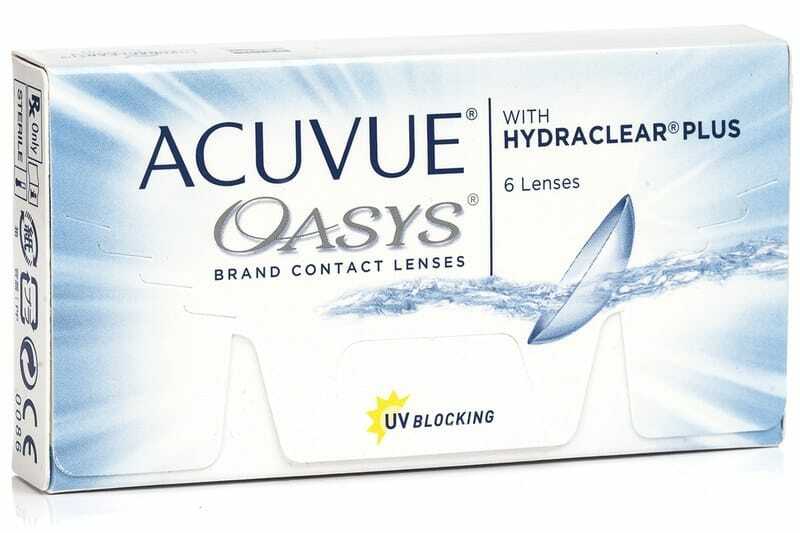 Acuvue Oasys is top of the heap on both counts, with more buzz marketing words, and a higher price tag than a lot of the would-be competition. Personally I like to see contact lenses available in 0.25 increments beyond six diopters of minus, but that’s certainly not the norm. 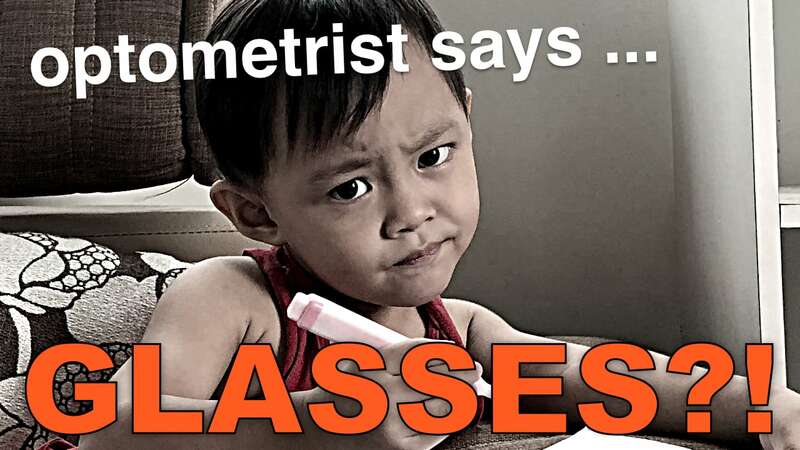 Most optometrist seem to be perfectly happy bumping up your diopters in half diopter increments at that range, even though that’s clinically know to be terrible for your eyes. As long as you don’t have to go higher in diopters than you really need to, the Acuvue Oasys for astigmatism are fine. You may want to take the conservative route if your exact diopters aren’t available in this lens (and possibly go 0.25 lower rather than higher – check out the diopter conversion chart). This review would get way too long diving into the why and how, but know that your eyes will thank you. In case you are curious, you could dive deeper into how minus lenses cause progressive myopia, especially hyperopic defocus caused by use of distance lenses for close-up. Pretty low here, at 38%. High water content lenses today available upwards of 60% water content, this one warrants consideration. Especially if tend to have dry eyes in the first place, you’ll want to get a sample first and see how you do with them. I’ve tried the Acuvue Oasys 1-Day and I personally do not like it. It was uncomfortable and irritating, and I couldn’t wear them for longer than five hours. Maybe I should give them another try. Considering the rather steep price of the Acuvue Oasys for astigmatism, this is why you probably want a test pack before potentially committing to these lenses. Alcon dailies seemed to be the lenses to beat when it comes to wearability for sensitive eyes. And indeed with a Dk/t of 121, Acuvue Oasis for astigmatism could be worth a shot (despite the relatively lower water content). Acuvue touts their HydraLuxe™ technology, which goes into more marketing fluff talk than your darling eye guru can handle (“tear infused” anyone?). They do have a nice blue tint so you don’t lose them as easily, and the etched on text helps making sure you don’t try to put them on your eyeballs inside-out. Overall it’s hard to quantify the benefits of any given contact lens based on what’s on the box (besides sizing and diopters). Test packs, as I like to repeatedly recommend, are always the way to go with these. Neither price nor specs really tell the whole story when it comes to your specific eyeballs. So let’s move on to the subjective parts of this review. This part is per the impressions and notes from our own lens-test monkey, aka the lab rat, aka Jessica the Intern. The lenses initially feel comfortable. Jess has sensitive eyes but can tolerate most of the lenses marketed towards ‘dry eyes’ type of wearers pretty well for the first 1-2 hours. After that things get more touchy with different lenses (Alcon is her favorite). In this case, the Acuvue Oasis for astigmatism stayed comfortable for 5-6 hours, after that they started to wear uncomfortable. Especially with extended close-up time (which is the worst way to wear contact lenses), 5 hours seem to be the outer limit for these. Of course individual mileage varies greatly, and you may be able to go longer by taking breaks and possibly even using some plus lenses (reading glasses) to reduce your net diopters for close-up. These lenses really do work well if you have relatively high astigmatism and are sensitive to lens shifts. 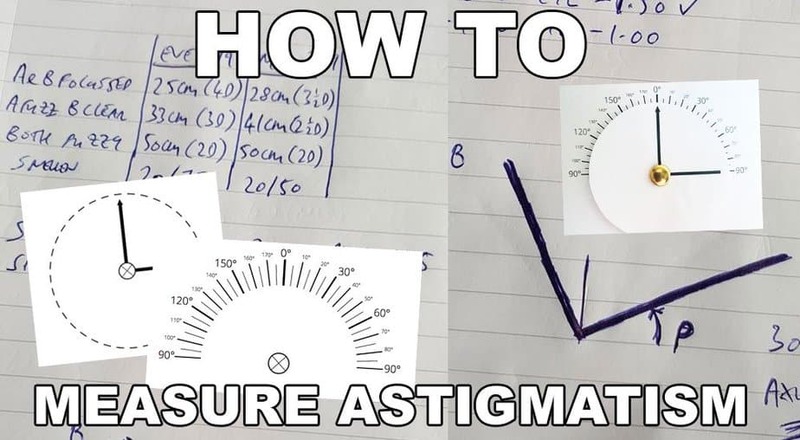 If you’re not familiar with the basics of astigmatism, it’s the part of your myopia where the diopter correction is applied to a specific part of your field of vision. That’s the ‘axis’ part of the so-called prescription, and if the contact lens rotates then this axis is changing. 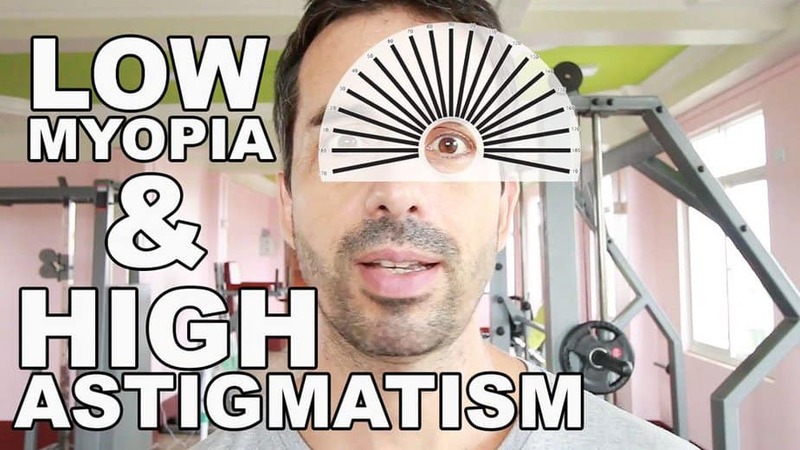 As a result you are no longer getting the astigmatism correction where you actually need it, and you’ll end up with weird double vision, distortion, and also likely headaches if you continually get exposed to these shifts. Luckily the Acuvue Oasys for astigmatism handle this issue exceptionally well. Our intern-test-monkey observed no shift of the lens at all, even when we subjected her (and the lenses) to all sorts of running, jumping, head shaking activity. 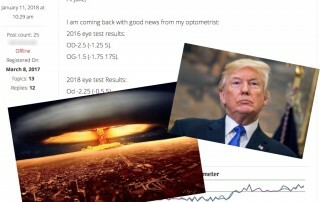 That’s good news and a major plus for these lenses. Contact lenses, Acuvue Oasys for astigmatism or otherwise, are great for sports and outdoor scenarios. You get a wide field of view with great peripheral vision and relatively high optical quality at a relatively low cost. Glasses can’t compete with these benefits and especially if you’re not suffering from dry eyes, you’ll likely be tempted to use contact lenses for all of your vision needs. There’s a big caveat to consider here, though. 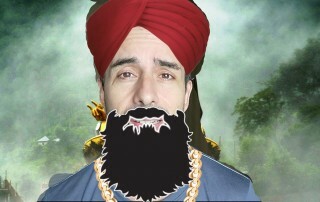 Think, everything has a price. There’s no magic bullet. In the case of contact lenses, a big factor to consider is corneal scarring and even worse, corneal thinning. 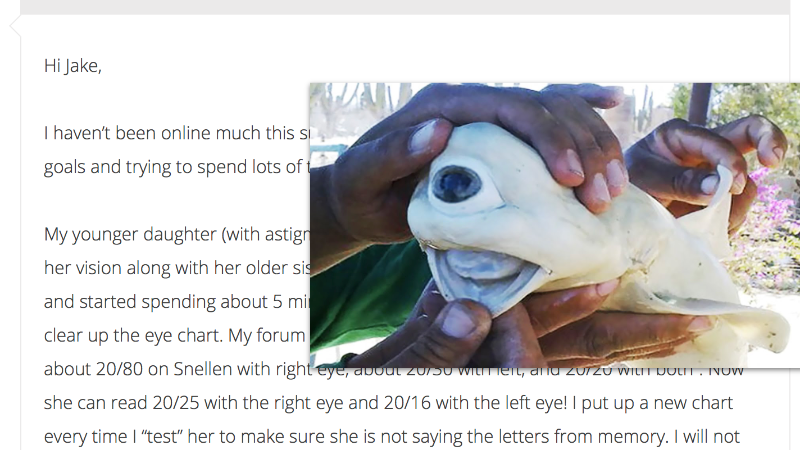 If you go to Google Scholar you’ll find a fair bit of scientific evidence in form of clinical studies, showing that your corneal thickness will be affected by long term contact lens wear. Especially if the vast majority of your daily vision is close-up (computer job, plus your enormous screen addiction), there’s no need to take this risk. During close-up you use no more than 5% of your field of vision. You can wear glasses for this and never notice the difference. This will help prevent corneal issues and also help reduce the risk of displacing too much of your tear fluid (dry eyes). I always recommend using contact lenses only when their benefits are going to be something you actually use.